There's a scene in the beginning of Teen Titans: On the Clock where Robin gives a supposed rousing speech about the role of the Teen Titans and their place in the DC Universe. Says stereotypical bad girl Ravager, "Commence barfing." Unfortunately, for much of On the Clock, the reader's sensibilities are with Ravager, rather than Titans stalwarts Robin or Wonder Girl, who each come off particularly whiny and judgmental. On the Clock gets off to a bad start in that I'm not necessarily sure we like these characters any more; lackluster story and art don't help the case. Given that the original current Teen Titans roster has been reduced to just Robin and Wonder Girl, it seems increasingly important that these two characters anchor the team. Unfortunately, Titans writers Geoff Johns and Adam Beechen had each written Wonder Girl as extrodinarily whiny of late, offsetting any actual emotion the reader might share in her mourning of Superboy's death, even as Robin pined over starting a relationship with Wonder Girl. While new Titans writer Sean McKeever does put an end to the possibility of that much-decried relationship, Robin and Wonder Girl don't improve in this collection. Wonder Girl appears overly critical of Ravager, even as Ravager nearly gives her life for the team, making Wonder Girl seem the one who can't get along; Robin, for his part, pontificates and orders his teammates around such that the reader wouldn't ever imagine wanting to spend time with this character. McKeever accomplishes the goal, perhaps, of endearing the reader to new characters like Miss Martian and Kid Devil, but at continued cost to the two Titans founders. 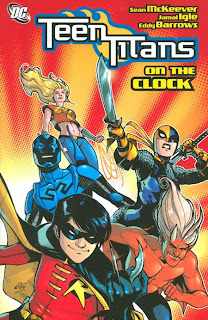 As with the previous volume, Teen Titans: Titans of Tomorrow, On the Clock suffers from a bit of plot repeat-itis. Titans of Tomorrow featured the Titans, split off individually, fighting their dark future reflections; On the Clock has the Titans, split indivudally, fighting a group of Titan duplicates, the Terror Titans. Titans of Tomorrow repeated a similar plot from Beechen's Titans East, but now McKeever is essentially repeating himself. I don't favor these stories where the Titans split only to come together in the end; it contributes to this feeling that the Titans aren't a team so much as just a loose group of individuals, and not ones who like each other all that much, either. In addition, I didn't much care for the Terror Titans, whom McKeever doesn't really introduce and none of whom were presented as competent enough to hold my interest. When Johns wrote Titans, villains like Brother Blood were built up and nuanced -- there wasn't much to the Terror Titans to want to see them succeed, even a little, against the Titans. McKeever succeeds here only for the most part where he did in Titans of Tomorrow, in his writing of the new, mostly unexamined characters. Miss Martian is an interesting, conflicted joy to read on every page, as is Ravager; I also liked Kid Devil's team-up with Blue Beetle in the last chapter, though McKeever's Blue Beetle is a plain "good guy" without much of the depth found in the character's own series. One additional bright spot was the appearance here of the Dark Side Club. In and of itself, the Club isn't differentiated here much from Roulette's metahuman fight club in JSA or others, but the hints of Final Crisis loom loud and large. This is commercial crossover pandering at its finest, and I love, love, love it. I also appreciated how McKeever made mention of the Birds of Prey's interaction with the Dark Side Club, tying the two series together. To be honest, if I were reading Teen Titans in monthly issues I think I might very well drop it. I'm surprised and disappointed to feel this way given the auspicious start Geoff Johns gave this title a few years ago, but McKeever's writing just doesn't move me. Eddy Barrows art still seems rather dark to me, as well; I liked it with Ruy Jose inking, but not with Jimmy Palmiotti and others. What keeps me on this title is more its ties to Final Crisis and the forthcoming Deathtrap crossover; it's not a terribly convincing reason to keep reading a book, and I'll probably have to reassess after I read the next volume. We're following Blue Beetle from title-to-title; next up, Booster Gold! I'm beginning to think I'm the only one who likes McKeever's Titans lately. It was these issues, I think, that got me to like characters like Kid Devil and Ravager that before I just found annoying. I remember being annoyed by Wonder Girl at this point, but like you say that goes back to Johns's treatment of her since OYL and 52. I can say that in more recent issues McKeever has managed to make me like Cassie again--we'll see if the same is true for you when you get there. I'm not entirely sure why McKeever was given this book to follow Johns. Its a tough act to follow and its only recently that DC's been trying to get it right with Rucka replacing him on Action Comics and Sturges and Willingham taking over Justice Society of America. This books one of the reasons I think DC has only a ~35% share a month because whilst Marvel has its Avengers as its highest selling books per month the only DC book to even compete is Grant Morrison's Batman. There's no way a McKeever (Teen Titans), Winnick (Titans), Duffie (JLA) and Johns (JSA) trio on its A-List team books can compare with Bendis, Bendis (New Avengers and Dark Avengers), Slott and Slott (Mighty Avengers and Avengers: The Initiative). DC needs to give the Titans and JLA books more respect and put A-List talent like Kurt Busiek or Greg Rucka on them. McKeever's Titans just doesn't sit well with me, and I'd be interested to hear from readers who did like it, so I can get a different perspective. Fayzan, you're right on that DC's not putting the power on its top titles. It seems like DC has a strategy to get its books established (Blue Beetle, Justice League) and then switch to a lesser-known team when the book's doing well, and I just don't think it works. Geoff Johns leaving Justice Society especially concerns me; I hope that book can still hold its own without him. "This book's one of the reasons I think DC has only a ~35% share a month because whilst Marvel has its Avengers as its highest selling books per month the only DC book to even compete is Grant Morrison's Batman. There's no way McKeever (Teen Titans), Winick (Titans), Duffie (JLA) and Johns (JSA) trio on its A-List team books can compare with Bendis,(New Avengers and Dark Avengers) and Slott (Mighty Avengers and Avengers: The Initiative). DC needs to give the Titans and JLA books more respect and put A-List talent like Kurt Busiek or Greg Rucka on them." I count 4 DC writers in that paragraph. bad story aside what I want to know is what is up with Robin's hair? A bit late to the game on this one, but I figured I'd give my thoughts. I love Geoff Johns run on the title, but one thing I always find baffling is the emphasis people put on the Young Justice crew. The thing for me was that those were the characters I was least interested in reading about. I had little emotional attachment to the four and from what I knew of them they didn't exactly resemble the characters from Young Justice. The characters I wanted to read about were the ones that sadly got the least emphasis. I came into the Titans fold from Geoff's run - I didn't experience any of the Wolfman run until much later - but the characters I felt were the most interesting were Beast Boy and Raven. Same goes for Starfire and Cyborg, though they were criminally underused. The Young Justice four were alright, but aside from Bart I honestly didn't feel as much of an attachment to them. If anything, I've always felt that it's not the name characters you should be focusing on - they have gobs of places to show up and have adventures - but the lessers whom rely on the one title to appear. Many classic runs on team books really rely on doing this and it's part of why they work. I pretty much stopped with Titans East and never bothered to catch up; Beast Boy and Raven are supposed to be coming back on the teen team, so my interest has shot up remarkably. I guess my perspective - especially after checking into the criminally under represented in trade Wolfman run - is that the big names aren't the real draws of the good runs. For me, it's always been about the other guys. Most of the best moments, most of the interesting plotlines and most of the memorable moments. I want to read about them, not the Wonder or Bat spawn. But what frustrates me about McKeevers run is that it just does not do justice to a concept I think could work; namely a Titans team without household name characters or at least with fewer of them. McKeever had some good and bad characters, but at every turn it felt like he was tripping up. Half his run found the Titans encountering another evil analogue Titans group - his run has literally made the concept a cliche at this point - and on the other hand he had a habit of taking all of the most interesting characters of his team off the board. I mean, what reason was there to get rid of Ravager or Miss Martian? For that matter, how is Bombshell even a remotely good addition? There's another thing that killed McKeevers run; it had even more of a rotating cast than the twilight year of Geoffs run. Characters came and went willy nilly and they were often the most interesting ones. How are you going to keep folks interested in a team that doesn't even keep half it's characters for more than an arc? To make matters worse, the replacements were rarely as interesting. I think what Teen Titans needs moving forward - aside from Geoff Johns, of course - is a stable team and a decent writer. The book is just not going to work if the roster does not stay still for more than four issues. Felicia Henderson may or may not be that writer - hard to tell from one issue, but it felt better than what I've read of Teen Titans in the interim between Geoff and Felicia - but the team itself needs to be locked down a bit. Throw Superboy in there to appease some of his fans - maybe throw Bart and Traci 13 in there for good measure - and just lock it down. Otherwise the title is just going to continue to continue to be mediocre. I think if they don't do that there isn't much chance for the title to regain it's footing with it based around the arc structure. Interesting perspective. Personally I feel much the opposite about the team make-up -- I'd rather see Teen Titans as a venue for teaming up big name sidekicks. It's rare that I'd read a team-up book about virtual unknowns -- in my mind, I'm not as interested in a character that I don't know as I am in Superman (and Superboy) and Batman (and Robin). But I recognize that's not necessarily how the original Titans series was successful for all those years. What frustrates me about McKeever's run is much the same as you -- too many Titans analogue villains, too much splitting up of the team, and an unstable roster (and too much general bickering). Dan DiDio said something interesting in regards to his taking over of Outsiders, that a new writer on a title going forward won't necessarily mean a large-scale roster change, and I agree that's what needs to happen on Titans. I'm just about to read Teen Titans: Changing of the Guard; we'll see how it stacks up. Well, the thing I think always worked about team books was the underutilized characters. When you look back at classic team books, especially Titans, it always felt like "Come for the Nightwing/Batman/Superman, stay for the Beast Boy/Firestorm/Martian Manhunter". I think one of the few books that honestly, truly worked with the "name characters" concept is JLA, which had three fantastic successive runs in Grant Morrison, Mark Waid and Joe Kelly. Usually focusing on the big characters doesn't work much. This isn't to say that the big name characters can't get great moments. Batman almost always does, for instance. But team books, to me, are how the lessers grow. I mean, the League and Teen Titans have done wonders for characters in the past that no one really cared about. But I guess I understand your perspective as well. I guess I've just come to think differently as I've read more team books. I mean, JLI had no one whom were names aside from Batman and that was great; the biggest player in Secret Six is Bane. I think many fans don't give books without names enough of a shot, because I've seen some of the lesser series be highlights of the line and still end up cancelled. It's really a shame. I read that DiDio interview too, by the way. I agree with the stance he's taking. I think these team books really need to solidify a roster. Which is not to say some characters can't come and go from time to time, but you need a core cast of characters you can invest in at the very least. Anyways, I look forward to the review of Changing of the Guard. I've only collected scattered issues of the McKeever run when I wanted to check in - I stopped with trades when Geoff left - but I'm thinking of catching up now that things look like they may be looking up. It'll be interesting to hear your thoughts on it.